Villa. 4 Bed + Den, 5 Bath. Sleeps 8 + infants. Windsor Hills Resort's reputation just got even better! The dueling slides and spash area are now open at the Clubhouse. Windsor Hills sets the standard for resort community amenities. Enjoy a wonderful vacation in Windsor Hill's largest 4 bed villa. Dedicated den/home cinema room and a separate AIR CONDITIONED games room, free wifi and long distance/international phone calls. Our spacious, luxuriously furnished, 2 storey villa adapts easily to large or small families and provides plenty of space for your group. Downstairs has a king sized master bedroom along with a twin bedroom. Upstairs also features a king sized master bedroom and twin bedroom. Each bedroom has its own private bathroom. All furnishings were chosen with comfort and luxury in mind. Your every comfort is looked after. The pool is south-facing with raised jacuzzi and extended deck. The poolside covered dining area (with ceiling fan) offers twice the living space of many other floorplans. The living room, kitchen and nook all overlook the pool area. Cable TV throughout with flat screen TV's in living room, den & bedrooms. Living room has a 32' Plasma TV and Den has a 37' flat screen, plasma TV with surround sound. The living room and den have access to Netflix for movies. There is a safe in the master bedroom to ensure security for your valuables. All bedrooms have ceiling fans. Child friendly features include two pack & plays, high chair and toddler chair, room monitors, stair guards and stroller - and our home faces onto the very large children's playground. Our air conditioned games room includes Wii with large flat screen TV, air hockey, foosball and ping pong. We're a family of Irish Dad & American Mom with two lovely young children. Florida is our 'home away from home' and we love enjoying all that Florida has to offer. 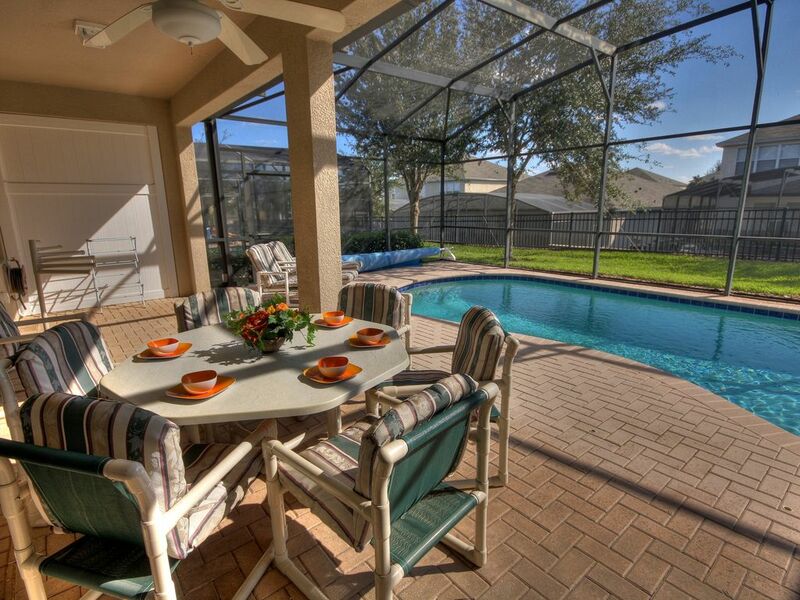 We chose the Windsor Hills home due to the great resort facilities and close proximity to Disney. A open and bright floorplan was an important part of our search as everyone needs space while on vacation. Largest 4 bed villa in the resort. New kitchen with granite counter tops. Air conditioned games room. Dedicated den with surround sound system. Exceptionally well managed and well maintained. Plasma TV in Living Room, Den/Home Cinema Room & all bedrooms. Netflix in Living Room and Den. South facing pool with jacuzzi/hot tub. Underwater lighting. Heating is optional. Amazing pool with cork screw slide as part of clubhouse. Tiki Bar, cinema, gym, sundry shop and concierge service also available at clubhouse. South-facing Pool - ensuring sun all day!, child safety fence, stair guards and kiddy equipment, valuables safe. BBQ is available for rent at additional cost. The Resort is beautifully laid out and guests at our villa enjoy free use of all the Resort Amenities, these include a Clubhouse and Recreation Area offering the following amenities, Heated Pool with huge cork screw slide, Jacuzzi, Poolside bar with hot food, beer & wine, Gym, 50-seat Cinema, Children's Play Area, Pool/Billiard Tables, Volleyball, and Tennis Courts, Video Arcade and Sundry Shop. There is a Gated Entrance manned 24 hours a day, the Fantastic Mystic Dune Golf Course is just next door, the Cinema is a particularly attractive feature - it can be booked free of charge for the screening of your choice from a selection of approximately 400 films, after an active day at the theme parks it is so convenient to have evening entertainment available without having to leave the resort. Easter Season : Saturday to Saturday bookings ONLY and 7 or 14 day period Flexible change over date, except for Easter period. Pool and/or Jacuzzi heat is quoted as an additional cost A $200 deposit secures the booking and balance is due 10 weeks prior to arrival. A booking made within 10 weeks of arrival is required for pay in full in order to confirm the booking. The $250 security/damage deposit is refunded after 7 days of departure, if no damage (above normal wear and tear) is found.